When it comes to juicer type choices, the price isn’t always the only deciding factor. The most expensive juicer isn’t necessarily the best one for you. So how can you know what kind of juicer best suits you? Should you buy a centrifugal, masticating, or triturating juicer? First of all, make sure you thoroughly understand the differences between the three kinds of juicers. Then find the exact answers for the following three questions, and the decision will be very easy for you. This is an important factor to consider before buying a juicer because they differ so vastly in prices. While most centrifugal juicers stay at as low as a few dozen to a hundred dollars, a good masticating one usually costs more than $200. Twin-gears are the most expensive – the good ones are at least half a grand each. Don’t splurge on an expensive machine unless you know for sure you’re going to make use of it. If you are serious about juicing, however, or have been spending a lot buying fresh juices from outside, it’s best to invest in a good one. It will pay off over time. How much time are you willing to spend on juicing? Whatever people say, juicing is definitely going to take you some time. You are going to do grocery shopping at least once a week. You will also have to wash and peel and chop and deseed the fruits and veggies, sometimes rolling them up or bunching them together. You will spend a few minutes on juicing itself. Finally, there’s cleaning up to do – you’ll have to clean the counter, brush the disc, and wash and rinse various parts of the juicer. Good news is, you can pick a juicer to meet with how much time you are willing to spend on the job. If your schedule is very tight, a fast juicer is the best gadget. It has a larger feeding chute so you don’t have to chop everything beforehand. It works at amazingly fast speed, and has fewer parts to clean. If you can spare about 15 minutes a day on juicing, you can go for a single-gear or a twin-gear masticating juicer. These two require materials to be pre-cut. They also take a little more time to make the juice and are slightly more difficult to clean. So if you’re planning to juice every day, you may find them more time-consuming. On the other hand, they make juices of much higher quality. You can even store the juice for a day or two, which means you don’t have to spend all that time every day. That is, if you are not like me who has a paranoia with stored juices even when I know they’re perfectly safe and nutritious. Choosing your type of juicer: What do you intend to juice? If you’re planning to juice only hard, thick fruits and veggies, a centrifugal juicer would be sufficient. Apple, pear, carrot, guava, cucumber, watermelon, you name it. As HuffPost argues, it’s much faster and simpler to use, which can make up for the alleged minor loss of some nutrients. Of course slow juicers are even better, but they also cost at least twice. 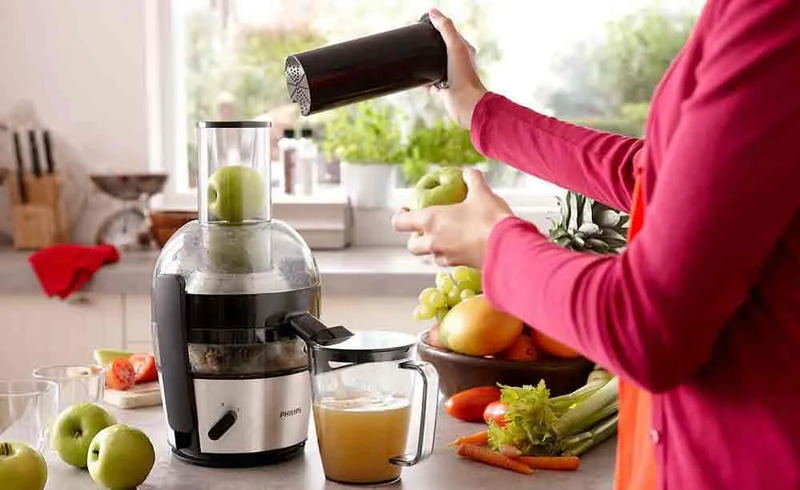 If you love leafy greens such as spinach, kale, and more hard-core vegetables like wheatgrass or roots such as beet or ginger, you will need either a single-gear or twin-gear slow juicer. The blades on most centrifugal machines are close to useless on soft leaves. For a quick summary, below is a table comparing the three types of juicers from a user’s point of view.